Joseph was born in Driffield, Yorkshire about 1843. According to the 1851 Census for Driffield, Yorkshire, Joseph, aged 8, was a scholar, born in Driffield and living with his parents, brothers and sisters at 77 Providence Place. In 1861, he was, aged 18, still living with his family but at Wrangham’s Yard, Providence Place. He was a cordwainer. On 11th September 1864 John married Elizabeth Hitchcock. John was a Shoemaker, aged 22 and Elizabeth 21. They were both resident in Great Driffield. Elizabeth’s father, John Hitchcock, was a labourer. The witnesses at the wedding were John Nalton, who signed with his mark and was probably Joseph’s father, and Mary Ann Hitchcock, possibly Elizabeth’s mother. Elizabeth was baptised in Ardley, Oxfordshire on 11th August 1844, the daughter of John and Mary Griffin, who married c. 1833 in Ardley. According to the 1881 Census, Joseph aged 38, was still a Cordwainer, living with Ann Elizabeth, his wife, aged 36. 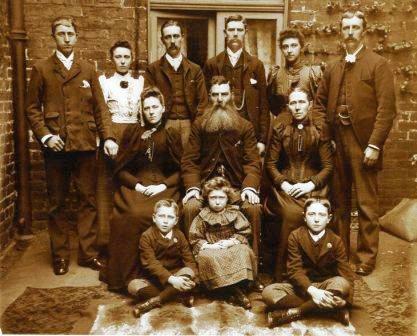 According the 1891 Census, the family were living at 53 Eastgate North, Great Driffield. Joseph was then a Shoemaker, aged 58 and Ann Elizabeth was aged 46. Joseph was still a shoemaker in 1895 when his daughter, Edith, was married. Joseph died, aged 58 on 29th October 1900 at 53 Eastgate North, Driffield. The informant was his son in law, John Gill, who was present at the death.